Well, it’s happening. Cookies was working on me for months to start my own blog. He was saying how easy my cooking is and how I should share the idea of simple meals that anybody can do. No fancy products, just things you can simply afford and find in the nearest store. Did I mention I love to cook? I do. Most of my time I’m looking for new recipes, searching the Internet and finding really nice ideas and inspirations. Always changing recipe for my taste and what I have in my kitchen. For example… everything I cook has to be grilled, fried, boiled or steamed… cos I don’t have an oven right now. You will ask: how can you handle? I say: easily, I just adjust. For days I was procrastinating which recipe to choose as my first post and couldn’t decide. And as always, I just had to wait a little and it came completely natural. Today I prepared HOT MUSHROOM SALAD. Got inspired by a recipe on the Polish site (mniammniam.com). The recipe is simple and takes not more than 30 minutes. Let’s start with croutons, cut bread into small cubes (I cut it too big and Cookies gave the meal 8 points out of 10), pour a small amount of oil/olive oil on the frying pan and heat it up. Toss in bread, salt it and sprinkle with thyme (maybe garlic too, though Cookies doesn’t like). Fry from all sides until golden brown and crispy then put aside. 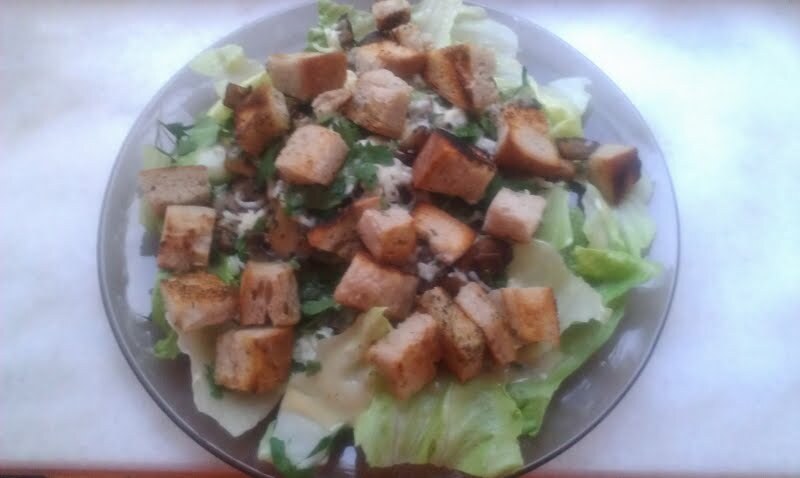 While croutons brown, clean mushrooms (remember white ones doesn’t need to be peeled, it’s enough to use paper towel to clean off any soil) and cut into thin, but not paper thin, slices. You can use the same pan from croutons, just clean it with paper towel. Add some oil/olive oil and 1/8th of a cube of butter. When hot, toss mushrooms into the pan and start frying. It will take some time, cos the mushrooms will leak water, you gotta drain it. Mushrooms need to be golden brown again, when it’s last minute sprinkle with salt and black pepper. While the mushrooms brown, prepare plates with lettuce, make sure pieces are small (again made it too big today o_0), spread it on the whole plate, toss HOT mushrooms on it, sprinkle with mozzarella and parsley. Add all dressing ingredients into a small jar and shake it good till it becomes emulsion. Pour dressing and add croutons on top. Cookies said it would be nice with some sliced almonds… worth trying.